I am 23 years of age and hail from Swansea. I am an enthusiastic and creative individual with a thirst and passion for life and a flair for turning my hand to anything. I love new challenges and believe that every opportunity that comes your way should be grasped hold of and appreciated! As a sole trader, I run my own business, Gower-Soaps, which is unequally Welsh, and recently won the title of “Young Welsh Female Entrepreneur 2011” at the Welsh Women Mean Business Awards for my work. 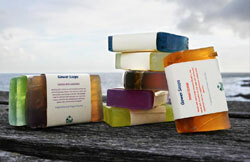 Gower Soaps is a Welsh based business that supplies handmade vegan and vegetarian made produce to the public and retail sector. Our focus is based on providing ethically sourced natural produce at an affordable price and to also raise awareness of key environmental issues and sustainability whilst doing so. In addition to this, we also aim to promote the benefits of natural produce as an alternative to synthetic products which can quite often contain harmful chemicals. By achieving this, it is our hope that more people will be persuaded to use cruelty free products and also be aware of the environmental issues surrounding the cosmetics industries. Creating the business has been a thoroughly rewarding experience and a great personal achievement, it is my hope that to act as a role model to other women thinking of starting a business and to share the message of the benefits it will not only bring to you, as a person, but also to others around you. Yesterday is history, tomorrow is a mystery, but today is a gift, that is why it is called the present.